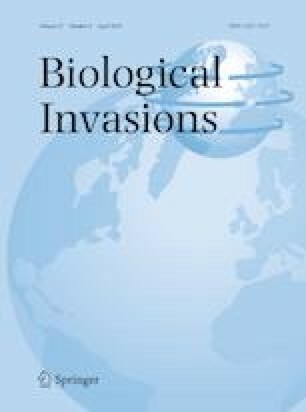 Control or eradication of invasive species is costly in terms of finances, labour and ecological and economic impact; the decision of how best to affect eradication or control may have long-term implications and costs. We suggest using population viability analysis (PVA) as a tool to evaluate relative efficacy of different control options for invasive species. PVA explicitly accounts for stochastic events impacting survival of populations at low abundance, which is critically important for representing founder effects of invasive species and appropriately calculating relative eradication probabilities. We demonstrate how PVA may be used to compare control options for hypothetical invasive populations of smallmouth bass, zebra mussels and northern pike. The model is parameterized using readily available parameters from the literature and provides a time series of population projections with uncertainty, as well as outcomes such as total control cost, probability of eradication and final abundance. Sensitivity analysis demonstrates that the ranking of various control options may change with parameter misspecification, demonstrating the importance of evaluate sensitivity prior to a final decision. When considering the appropriate response to invasive species, there is a trade-off between acting quickly and carefully considering all options using best available knowledge. PVA provides a balance between these two choices by providing a means to compare all control options and perspective values collaboratively with agencies and stakeholders in a way that quickly builds consensus for the most appropriate option(s) and facilitates action. Article Impact Statement: We present population viability analysis to accurately compare control options for invasive species in a decision-friendly framework. The online version of this article ( https://doi.org/10.1007/s10530-018-1890-1) contains supplementary material, which is available to authorized users.